Well, it's been utterly manic since the Three mobile & broadband network advert went live. Socks antics have registered well over 6 million hits on YouTube plus there have been millions of hits on remixes of the advert too. I have to admit I've always been very proud of Socks but even more so now. I love the part in the advert when George Tait (Elaine's dad) drives past on his tractor and Socks makes out as if nothing was going on but quickly resumes this fancy footwork as soon as he's gone. The Pony Mixer app allows you to select a style of music and dress Socks in attire ranging from a punk rocker to a boyband, yip headset and all ('mash up' they call it!). Have you tried it out yet? Even my retained foal from last year, Benston Rhianna (by Hermits Pedlar, out of Benston Eva), got to star with Socks in the 'Love' option. Dance Pony Dance!! From a media point of view it's been crazy. We've done interviews for TV, magazines and daily papers. Photo shoots with photographers from south and locally and not forgetting the happy snapper who wants their photo taken with the moonwalking pony! He even got a red nose for Comic Relief Day!! The advert is magical, light-hearted and encourages you to smile and 'share' with your family and friends. It shows some magnificent Shetland scenery. How lucky are we to have such breathtaking beauty on our doorstep? We so often take it for granted. We've had the most incredible response. We've received emails, texts, phone calls and messages through social media websites from all over the world. It's at times like these that you realise that the world isn't such a big place after all and that a 1 minute advertisement can bring millions to chat, laugh, giggle, discuss and share a moment with someone else. 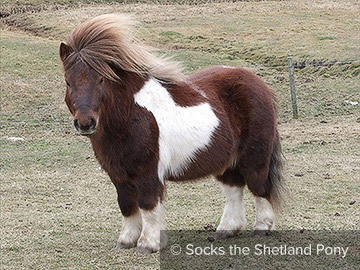 As you can see from the photos, Socks is a real Shetland pony who loves to roll, get muddy and caper with his friends yet he has a gentle side when he puts his head on my shoulder or nuzzles up alongside me for a cuddle. 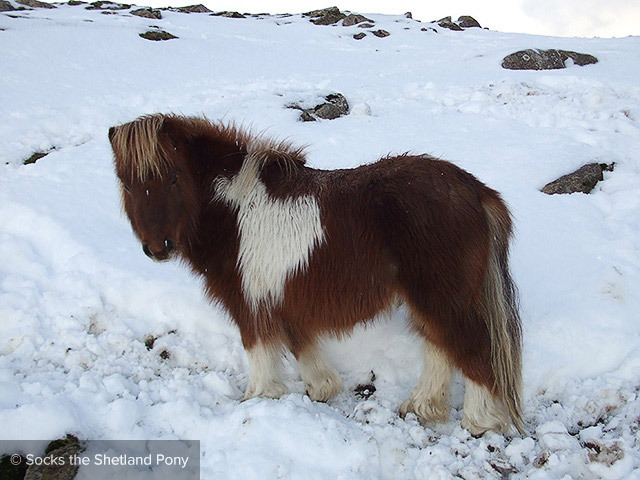 I sincerely hope that the advert has a positive effect on Shetland and everyone's Shetland ponies.